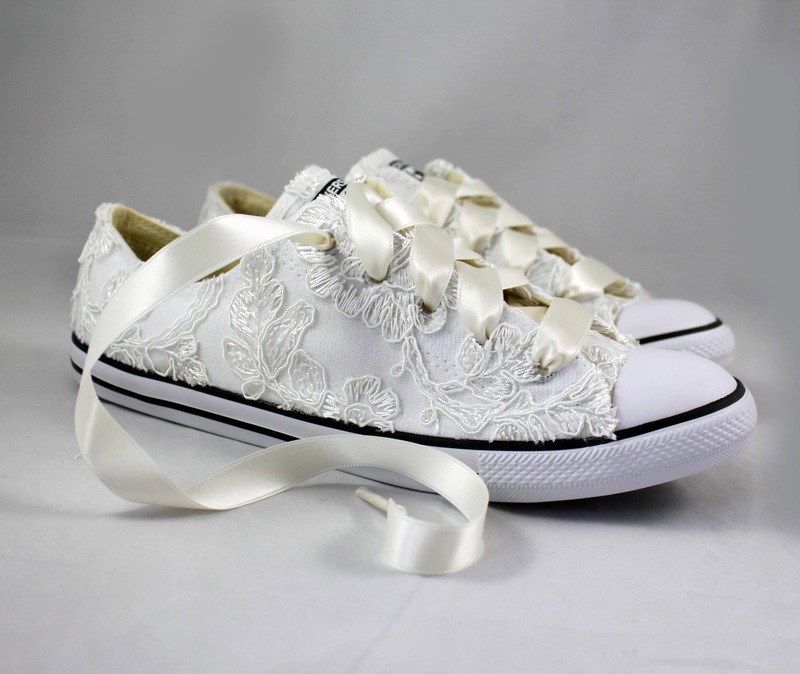 For the girl who wears her Converses to every occasion.... why shouldn't you wear them to your wedding? 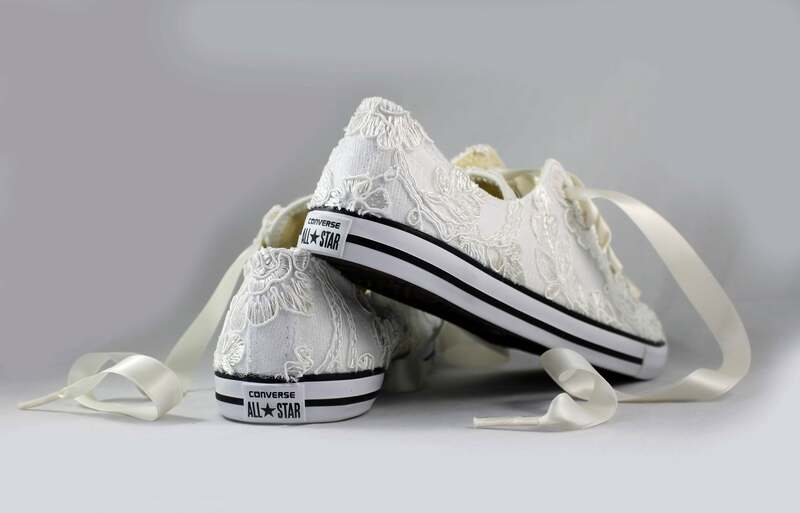 Skip down the aisle in comfort in these beautiful white Converses adorned with ivory lace! 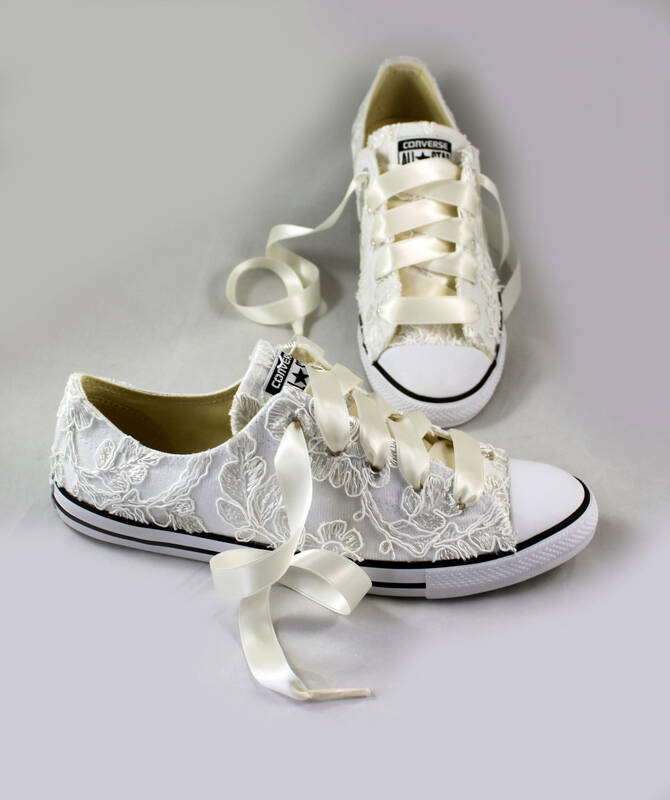 Pictured in white converse shoes, with ivory lace and Ivory ribbon shoelaces. Due to shoe sizing and because each shoe is made individually, lace placement and pattern placement may differ for each pair of shoes. Alternate ribbon shoelace colors are available upon request. Also available in white, pink or champagne lace. Available in all colors and styles that Converse currently offer. 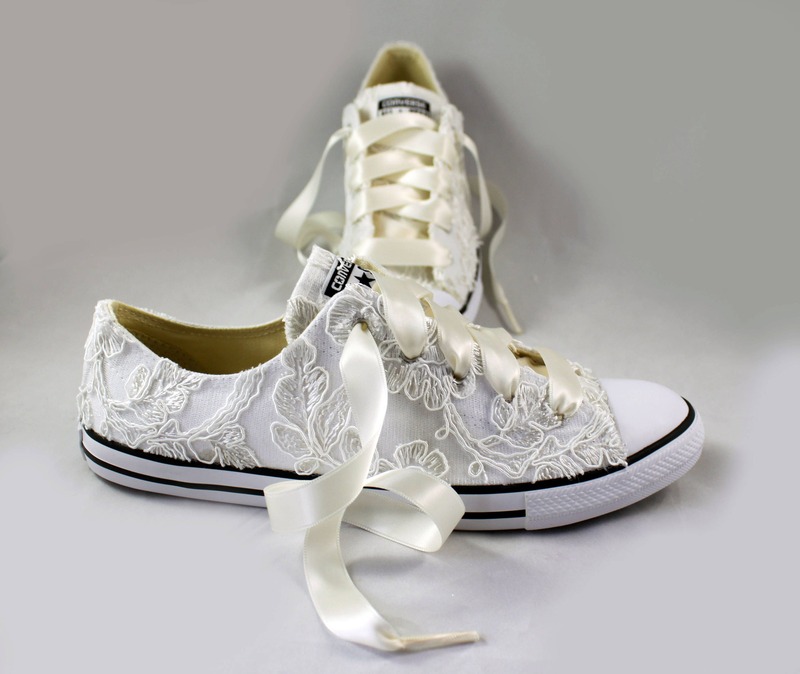 Please note that this is the Dainty OX style, which is a women's specific shoe from Converse. The Dainty OX style tends to run narrower and fits a little differently than the original Core style. This style is not available in half sizes. If you are in between sizes I recommend rounding up. 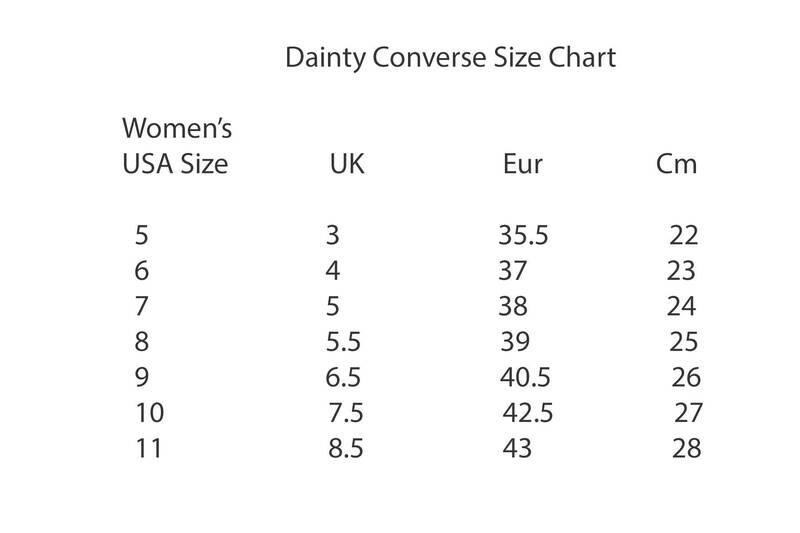 All shoe sizes on the drop down menu are women's USA sizes. Please message me to check your size is available before ordering, as some sizes may be out of stock in certain colors. Please follow tracking on your package and once you see it pass through your country's customs start looking for a pick up notice. If you have not received a notice for pick up from your local postal service, please take your tracking number to your main post office and ask them if they have any information regarding your package. Your tracking number for your order can be found under your etsy "Purchases and Reviews" section or in the email I sent you notifying you that your order has shipped. If the tracking status on a package show up as "Out For Delivery" and you have not yet received your package, this most likely means that your package needs to be picked up in person from your post office. For most international orders, customs usually requires the packages to be picked up in person. Please be prepared to show your Identification and pay your country's VAT charges. You are responsible for all VAT charges on your package. This is a charge that each country imposes on incoming merchandize. Most countries charge 10-40% of the items value. Please be prepared to pay this tax, as it is your governments fee on incoming goods. The local postal system usually leaves a notice that your package needs to be picked up, but the may have forgotten to do so. Please check with the local postal system and see if they have your package. If the local postal system do not have your package, please check with customs and the local delivery person and see if they delivered a package or a notice for you. Please understand that once you package leaves the USA, your package is under the supervision of your country's postal system and customs and I have no influence or ability to handle any situations from here. In most cases if packages are not picked up within a few days the postal system will decide to ship the item back to the usa. Here is the USA USPS tracking link. Please enter your tracking number for additional information regarding your order. Fairy Tale shoes, making your dreams come true. Please note our shop policies before purchase. Please note that due to shoe size differences; applique and crystal placement may vary slightly from the image displayed. Also, colors may vary slightly due to variations in computer monitor display settings. Most shoes are available in USA sizes 5-12. If you receive your shoes and they are too large and slip in the heel, we encourage you first to try a back of the heel cushion or a ball of the foot pad to reduce the slipping; these can be found at most department stores. 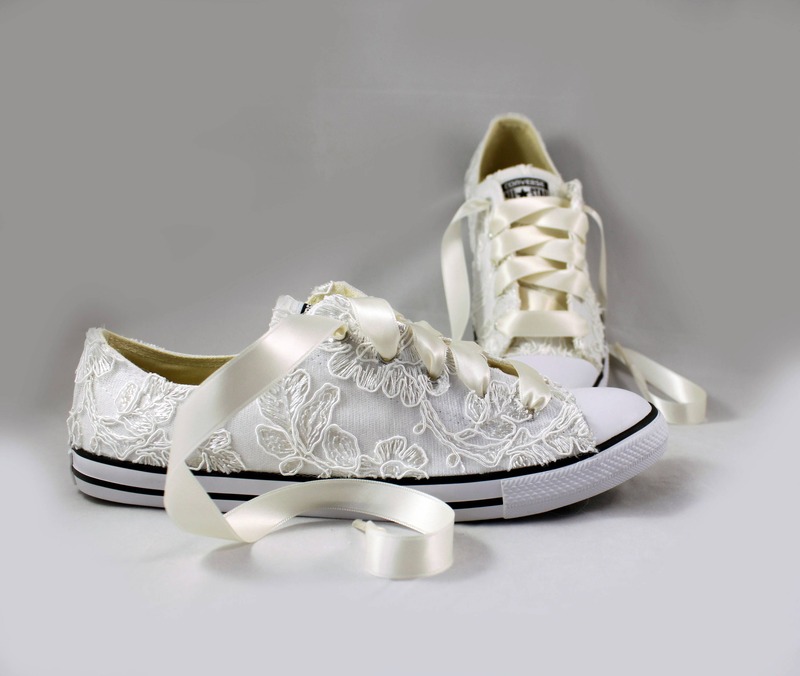 Dyeable satin shoes are delicate and are not colorfast. If dyeable satin shoes are exposed to moisture the dye will bleed. You can minimize this by not wearing your dyeable shoes where they may get wet, such as in damp grass and on rainy days. If you are in an area of very high humidity do your best to limit non-essential wear time while outside. To help protect your shoes from small amounts of moisture you can also spray them with a rain guard spray. Rain guard sprays can be found on Amazon or at specialty shoe stores. With the first few wears of your new shoes, you may experience some color rubbing on your foot. With dark colors in particular this is normal. Soap and water can be used to remove any color rubbing on your foot. Custom orders will take at least 8 weeks (but it is worth it!) 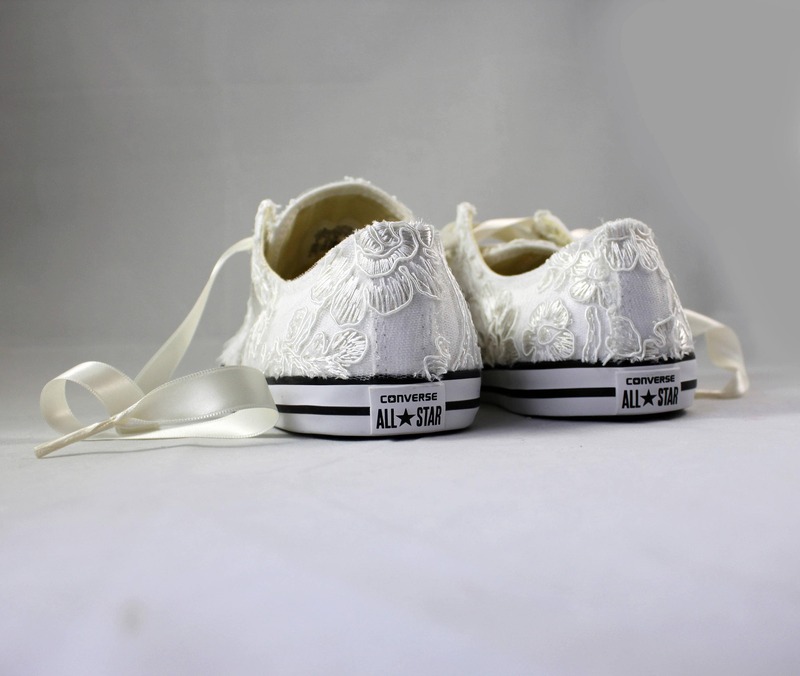 Shoe completion dates are based on a first come first served date. Please allow an additional 1 week for shipping within the USA. Need shoes sooner than the estimated lead time? It is best to contact me for rush order options AND wait to order until you receive a reply. Rush Orders generally incur and additional $50 rush order fee. Please do not purchase your shoes without waiting to hear a response. Failure to do so may result in a cancellation of your order and a 25% material restocking feel. Orders shipped to North Carolina Residents will be charged sales tax. All others will not be charged sales tax. Available upon request. Please message me for details. Due to the nature of the crystals and because each crystal is applied by hand, it is possible that you will lose some crystals with each wear. The shoes should be treated as a worn work of art. I will include an extra bag of crystals in each pair of shoes just in case some do pop off. It is not difficult to reapply crystals with a touch of super glue. Due to computer monitor color setting displays, shoe colors may differ in person. If you are concerned about receiving a color match to your dress, you are more than welcome to send me a swatch to match. Amazing amazing shoes! Seller was so friendly and responsive can’t wait to wear these on my wedding day! I got them and they look just like the picture. Thank you!